There are many things that set normal stationery and fine stationery apart. Whether it be the luxurious print methods, the super thick luxe boards that come in a range of colours and textures, or the absolute attention to detail, the high end stationery we produce will wow even the harshest of critics. Having your own headed writing paper and correspondence cards becomes part of your lifestyle. With a lot of other older traditions and crafts disappearing with the digital age, fine stationery has stood the test of time, the crafstmanship unrivalled by anything that modern age can throw at it. Now is the perfect time for you to start building your own fine stationery wardrobe. Lewis started his print journey as an apprentice on the workshop floor, learning the art of gilt and colour edging. Time passed and he wanted to try his hand at die-stamping, knowing that this was the pinnacle of the art of printing. 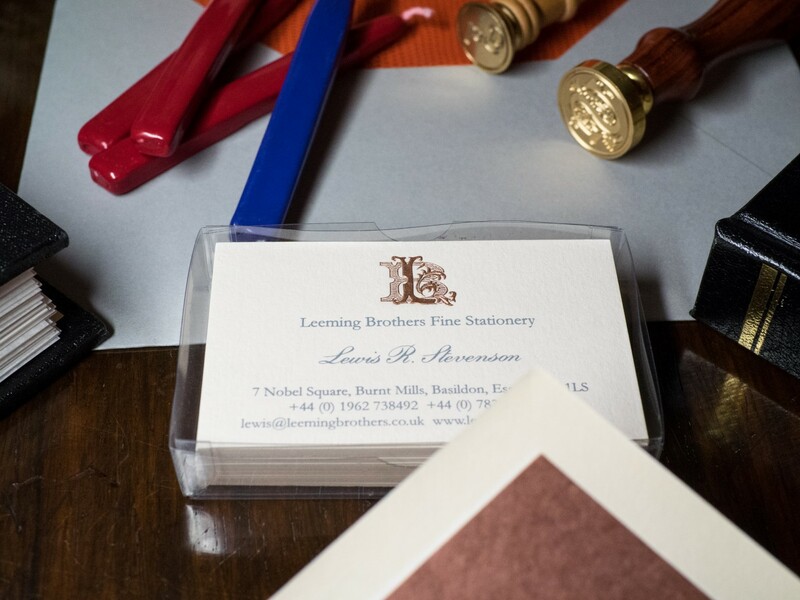 Being a perfectionist, he was happy spending years honing the craft, producing beautiful suites of engraved stationery until the opportunity arose to run Leeming Brothers. He now does so with a keen eye for detail, and has found the hands on experience he learnt in the workshop invaluable. He is dedicated to his role and strives to make every client feel as important as the next. He is currently training to become a liveryman of the Worshipful Company of Stationers. Paul started working in print straight out of college for his Father’s company, Intaglio Cards, who were established in 1953. Intaglio were a renowned printing house in the city who specialised in producing engraved stationery for Royalty and financial institutions. Paul started from the ground up learning each and every process along the way, culminating in the presidency of the British Engraved Stationery Association, and 43 years later still owns and cherishes the original copperplate printing machine owned by his Father that he completed his apprenticeship on. Pauline started at Frank E. Seary Ltd, the engraved stationery company that can trace its’ roots back to the 1880’s. She originally started there at the age of 27 on a temporary basis for 2 weeks having previously worked in the legal profession, and now 44 years later is still in the engraved stationery industry having worked her way up to Sales Director and Royal Warrent Holder at Searys and is now co-owner of Leeming Brothers.